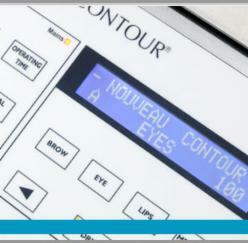 At Nouveau Contour they strive for 100% customer satisfaction. All products undergo rigid tests prior to market release to guarantee not only the best quality but the highest safety level. Following these commitments, the R&D and production facility is certified according to ISO 9001 and EN 13485 (European medical standard) and equipped with the most advanced technology. The Nouveau Contour Intelligent, the first computer-controlled device worldwide and the Digital 700, Nouveau’s digital device are a unique 'state of the art' system. The Intelligent provides the practitioner with state-of-the-art computerized technology. It is equipped and controlled by an Intel microprocessor “chip”. The Intelligent’s central processing unit offerst the most advanced features, which allow for the selection of pre-programmed settings for various procedures, i.e. eyebrow, eyeliner, lip color and medical procedures. The Intelligent was designed to assist the practitioner, in distinguishing between the varying areas of application, i.e. eyes, lips, eyebrows and medical. Software installed in the central processing unit, the operating system of the Intelligent, consistently calculates the best needle frequency (speed) needed to achieve optimal pigment retention. Skin structure varies according to the location, because the structure and tolerance of the skin is different for each area of application. For example: For areola pigmentation, the skin structure is very dense compared to that of an eye lid, which is very thin and supple. When set on “Medical” the Intelligent will provide a more efficient way to deposit pigment in those areas, by automatically increasing the power to the handpiece and by adjusting the needle frequency. In a similar manner, when the practitioner is working on an eyeliner procedure, the control unit of the Intelligent can be set to “Eyes”, which slows down the power to the handpiece and adjusting of needle frequency, therefore depositing pigment more gently. The Intelligent has more power than any other rotary device. The needle frequency can be adjusted from 50 to 180 punctures per second. This allows the practitioner more flexibility in needle groupings. With the increased power, the practitioner is able to perform every type of cosmetic and medical procedure available. The Intelligent has a LCD read out, which displays accurate needle frequency, which program you are working on and the needle frequency the Intelligent recommends for the procedure. A timer within the Intelligent, keeps track of actual procedure time and is displayed on the LCD. The Digital 1000 provides optimal results in less time. The digital control (microprocessor) assures stable needle frequency resulting in perfect pigment color retention. Touch-ups have become almost obsolete. The Nouveau Contour Digital 1000 is the most efficient device available and has many advantages over the traditional analogue devices. With traditional devices the needle frequency will drop when penetrating skin that is more resistant. Due to different needle frequencies the distance between the pigment “dots” will vary. The results are inconsistent lines and poor color retention. The digital control unit of the Nouveau Contour Digital 1000 assures a stable needle frequency, despite the resistance of the skin. When resistance of the skin occurs, the microprocessor will adjust the needle frequency accordingly. To make a simple analogy, imagine what occurs when you place your car on cruise control, when the car reaches an incline in the road, it speeds up maintaining a consistent and preset speed. In a similar manner the digital control unit will always maintain a stable needle frequency. 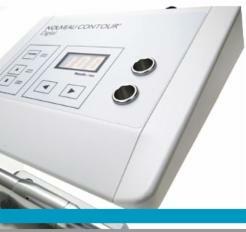 The Nouveau Contour Digital 1000 provides the technician with consistent quality and excellent results. The device is designed with soft touch buttons that provides a easy and hygenic cleaning of the machine surface.